Halloween is a great time of the year and it is a great excuse to come up with great décor ideas to enhance the whole experience. 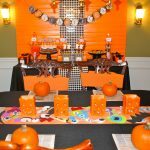 There are a number of ideas for home decor, ranging from spooky to fun, that you could implement in your home during this enjoyable seasonal event. 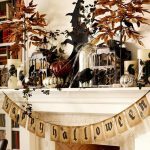 This is a good way of getting into the Halloween mood and if you have a have children they will definitely enjoy the process of decorating as well as the resulting look. 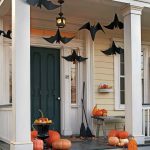 These halloween ideas will also ensure that you can appropriately welcome any trick-or-treaters to your doorstep. Nothing says Halloween quite like a carved pumpkin. But you don’t have to settle for the ordinary cookie- cutter Halloween pumpkin. 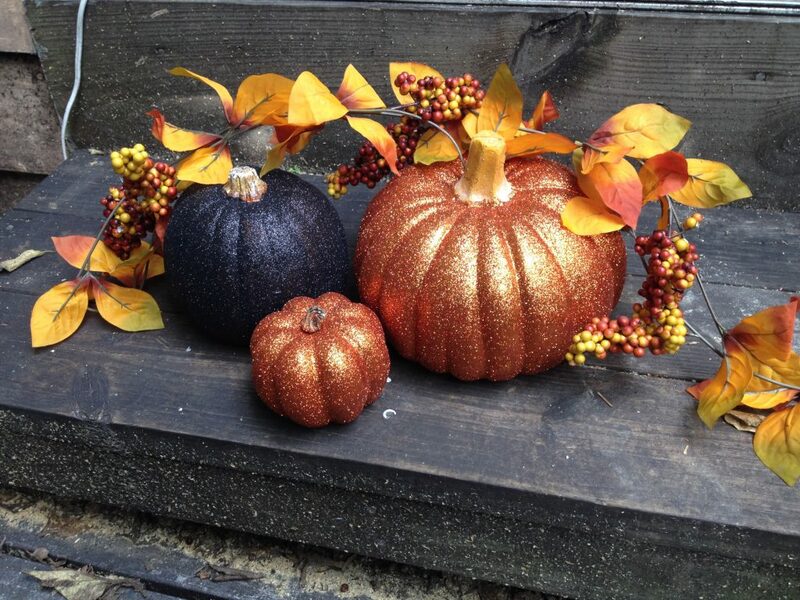 You can easily accentuate your pumpkins with decorative glitter. These glittery decorative pieces can be used to dress up your tables, mantel, porch or any other preferred space around your home. 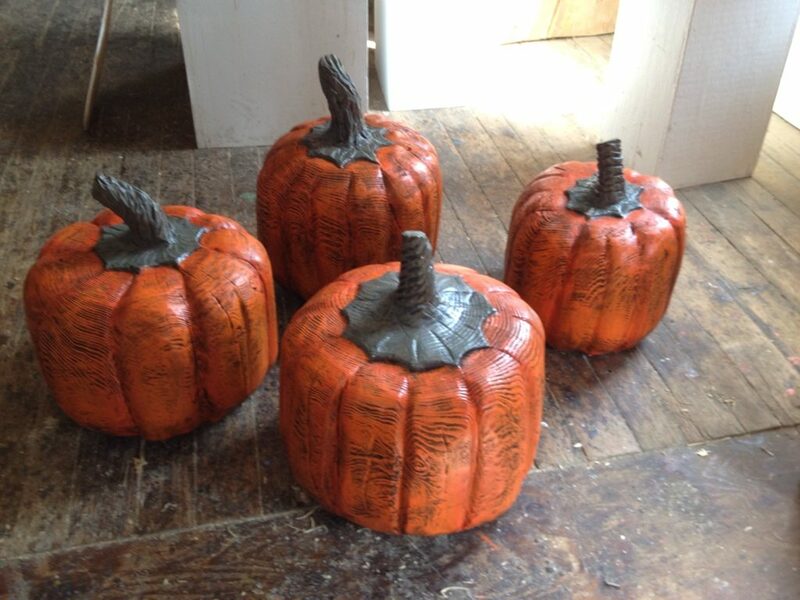 You could carve the pumpkins into pretty receptacles that can be used to store items such as treats and other trinkets. Glitter pumpkins can also be used as great Halloween-themed candle holders. If you enjoy DIY tasks you can go ahead and purchase the glitter and adhesive which you can apply on the pumpkin. 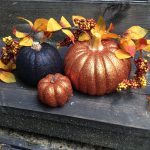 If you’re not DIY-centric you can simply purchase an artificial glitter pumpkin from a craft shop or check online for any other outlets that have them in stock. 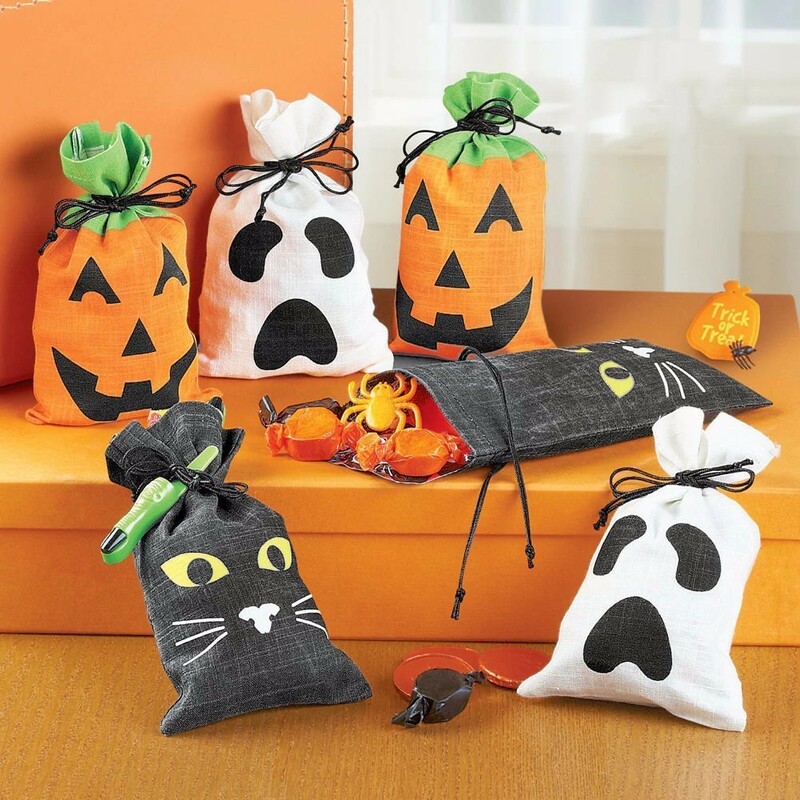 Creating your own personalized decorations is a great way of enjoying Halloween. The beauty of mason jars is that they are easily available and can be converted into attractive decorations using some creativity and DIY knowledge. 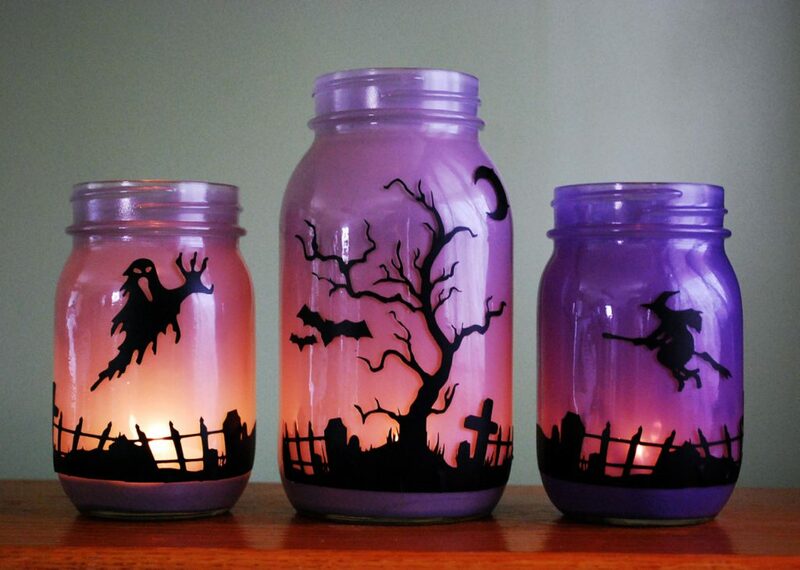 For instance, you could come up with an attractive container for candy using a mason jar. Simply wrap some glittery embossing paper around the mouth of the jar and drape the rest of it in mesh netting of your choice. You could add some stickers to complete the look. 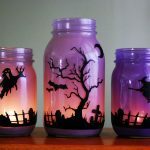 In addition to this you could also paint the jar with Halloween themed designs and use some easily available materials like gauze, Styrofoam, moss and twigs to create creepy looking set ups within the jars. 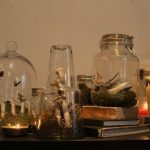 There are plenty of ideas that you could implement using mason jars so don’t limit yourself to designs that you have seen before. A simple way of adding some mystical appeal to your home during the trick-or-treat season is by using candles to cast shadows. 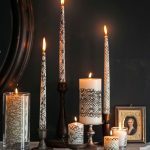 Using plain candles for this can be a bit of a drag and a simple way of adding some appeal is by wrapping them in a black lace design. 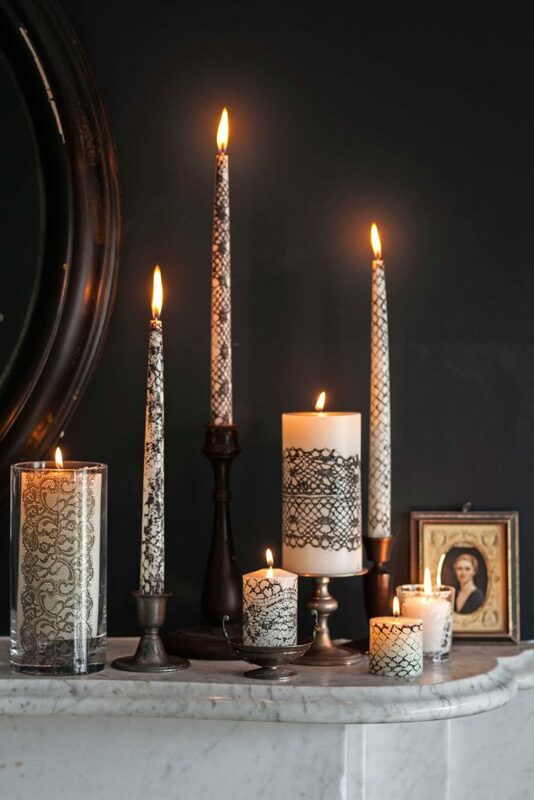 The contrast of the colors and the mesh pattern gives the candles a whole new look. It is important to note that lace material is flammable so it is not advisable to use actual lace fabric on the candles. The best way of achieving the look is by cutting a piece of lace, laying it on a disposable paper plate and brushing it with black tempera paint (nonflammable). Then roll the candles on the paper to transfer the pattern onto the candle shaft. Set the candles aside for sime time so that the paint dries before lighting the candles. What better way to welcome people to your home on Halloween than with a bunch of bats on your doorway (not real ones of course). Bats have a way of creating a spooky feeling and it is easy to either create your own designs or buy readymade bat decals from various outlets. It is quite simple to make felt bats by tracing the outline of a bad silhouette onto a piece of felt fabric and cutting it out carefully. Repeat the same process for different sizes and shapes until you have enough to create a realistic-looking swarm of bats. If you enjoy serving up some dark humor these are great ornaments to consider placing in your home during Halloween. They are basically small pots that are used to accommodate indoor plants. 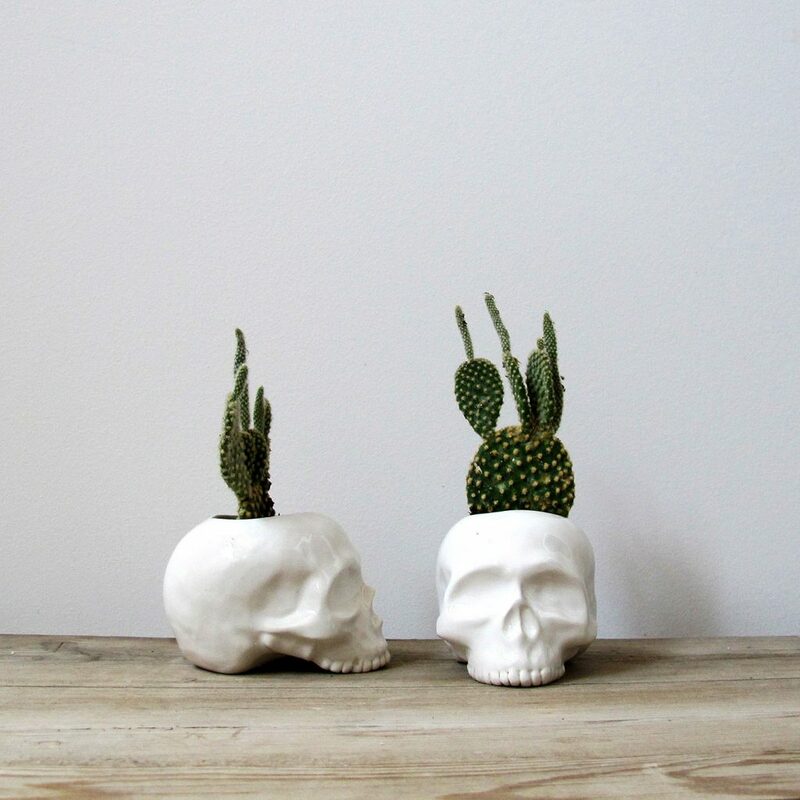 The skull planters come in various designs and materials ranging from wood to crystal. 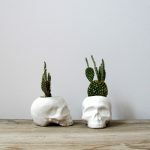 If you do not want to place actual plants in the skull planters you could opt for artificial foliage. 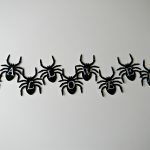 You can accentuate this décor accessory with additional Halloween themed materials such as faux spiders or cob webs. 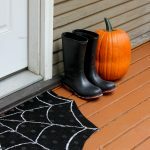 Welcome trick-or-treaters and other guests to your home with a spider web themed door mat. This is an accessory that will really show that you are in the Halloween mood. In addition to setting the right mood, these door mats are also functional by reducing the amount of dirt being tracked into your home. 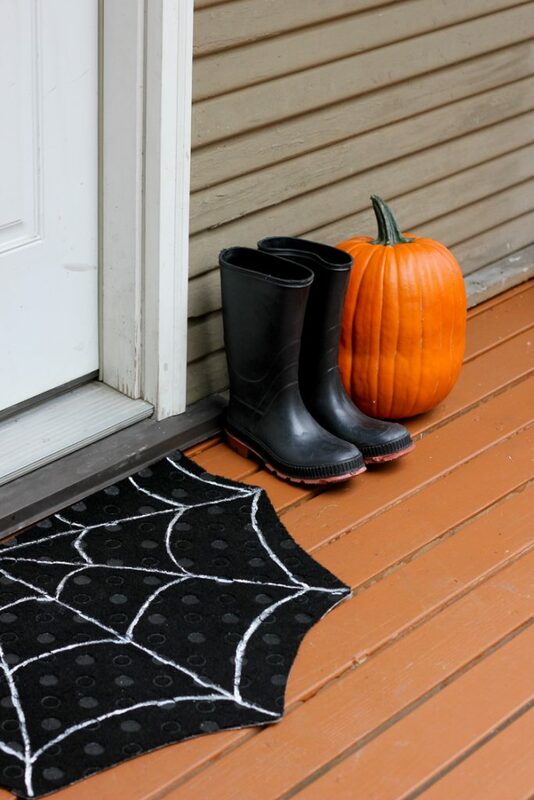 If you like this décor idea you could also look for similar spider themed mats for indoor spaces. There are plenty of colors, sizes and designs to choose from so don’t be afraid to experiement with different looks. Halloween-themed handouts are a great way of personalizing your sweet treats. 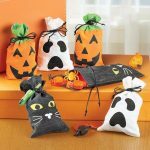 With a little ingenuity you can gather handfuls of treats and pack them into small colored bags. To add a personal touch you can add tie strings and a card with an interesting message. Hand out these party favors to kids and visitors during Halloween and enjoy the pleasant reaction from them. 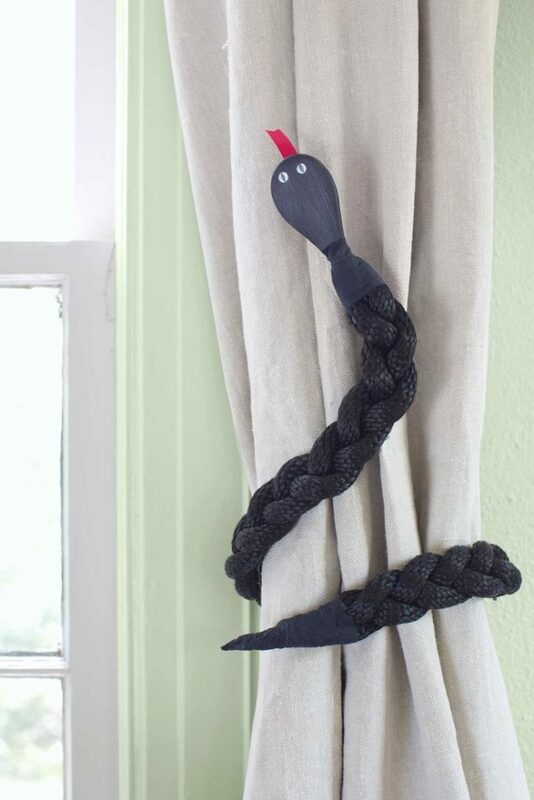 Test your DIY skills by intertwining three black ropes and securing the tail end with black duct tape and affix a painted wooden spoon (with the handle cut off) to act as the head of the snake. Use some white paint or stickers for the eyes. Finally, you can tape a red piece of paper under the wooden head to create the illusion of a forked tongue. 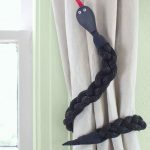 Tie this accessory around your curtains and enjoy the creepy look that may actually scare a couple of people. If you are unable to make this simple snake tieback, you could check online for readymade varieties which are supplied by various outlets. 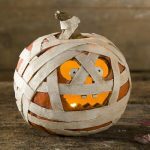 These are probably the easiest accessories to craft at home and they have a great effect on the overall Halloween décor in your home. All you need to have is a template of you preferred object and a colored paper for the final cutouts. Click here for a brief tutorial on how to make simple paper cutouts at home. 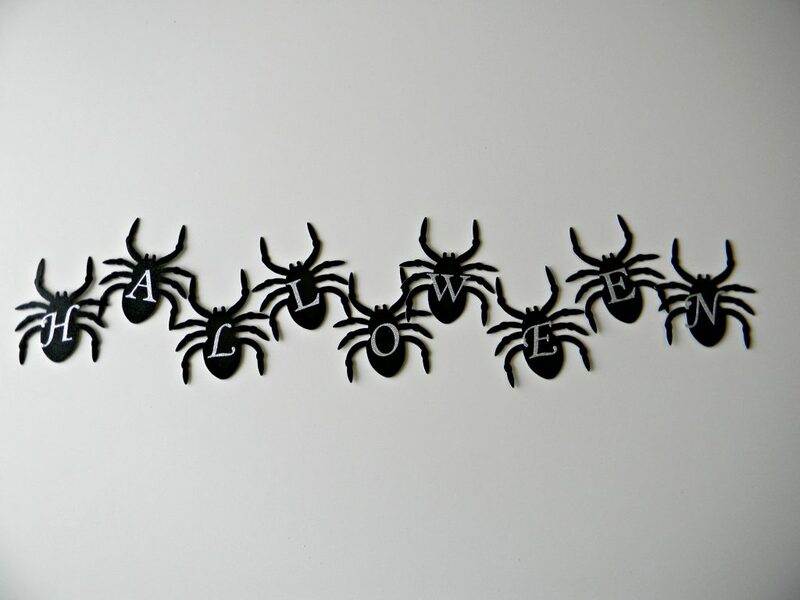 You can create cutouts depicting all sorts of spooky stuff like spiders, skulls, or even a series of googly eyes. Nothing exemplifies Halloween like a good old get-together. To spice things up a little you can come up with inventive themes for the party. For instance, if you have children, you could organize a Nancy Drew themed bash based on the famous investigative novels for kids. 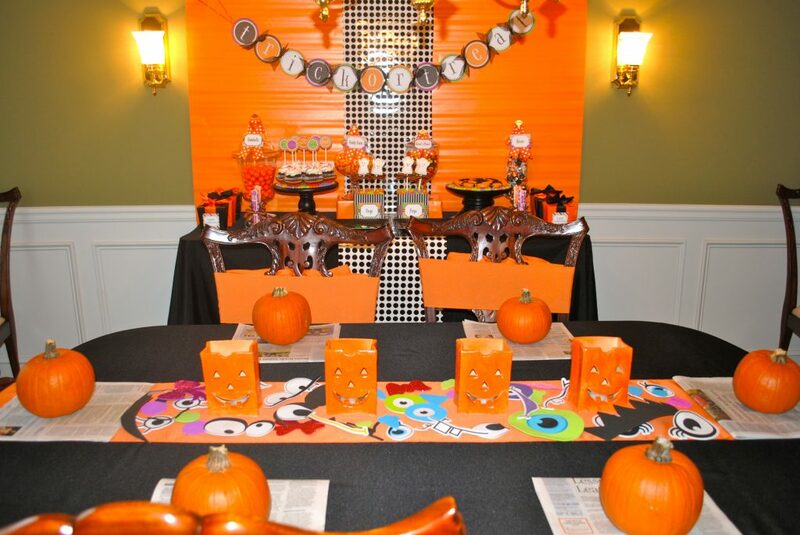 Make the occasion fun by incorporating props like magnifying glasses, maps, written clues and spooky draping. Be sure to come up with a plan for the event and consult the right people before starting with the preparation. 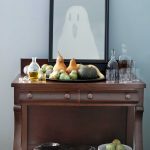 Creating a spooky illusion is quite easy using a mirror and it can go a long way in creating a great Halloween vibe in your home. All you have to do is draw a basic outline of a ghoulish figure on a frosted window film sheet. Then go ahead and cut along the outlines as well as the mouth and eyes. When you’re done, simply paste the film onto a mirror and voila! You have your very own phantom mirror. The Halloween mood can also be extended to your choice of clothing during this yearly event. If you do not have the time or budget to invest in a full outfit you could opt for these small but fanciful clothing accessories. Feather epaulets can go with almost any outfit and they can definitely help in setting the Halloween mood especially if you are hosting guests. If you are a DIY enthusiast simply look for some felt fabric and cut out two equally sized oval pieces that can fit on your shoulder. Look for a bunch of black feathers and hot glue each one to the two felt pieces. When gluing the feathers, start with the longest ones at the bottom and gradually layer them on top of each other to create a sort of mat with the wispy small feathers at the top. Once the glue has dried you have to find a way of crafting a clip that will be used to latch onto your clothing. You can do this by gluing a snap hairclip onto each of the epaulets. Once all these steps are completed you are ready to clip them onto your shoulders and mesmerize everyone. Currently there’s a trend of using farmhouse style pottery for design and functional domestic use. 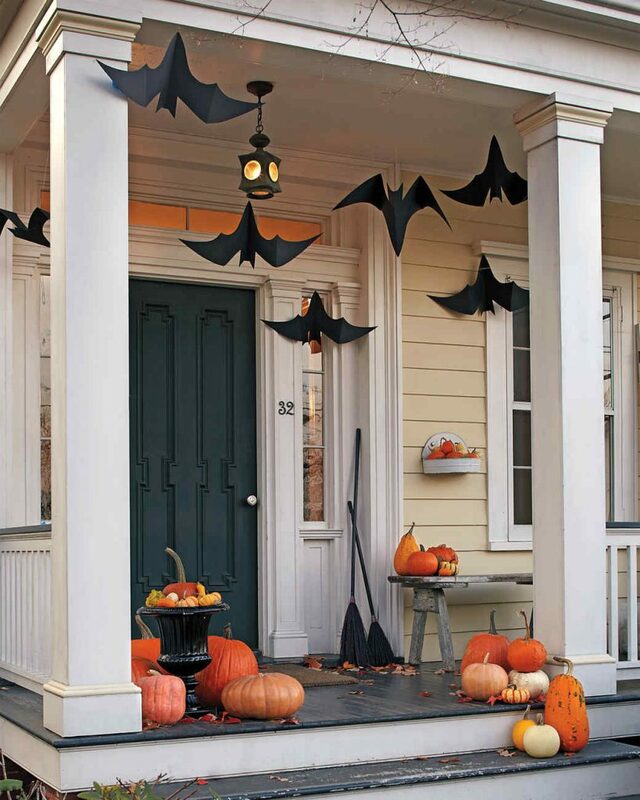 You can ride on this trend to incorporate a Halloween theme for your home. 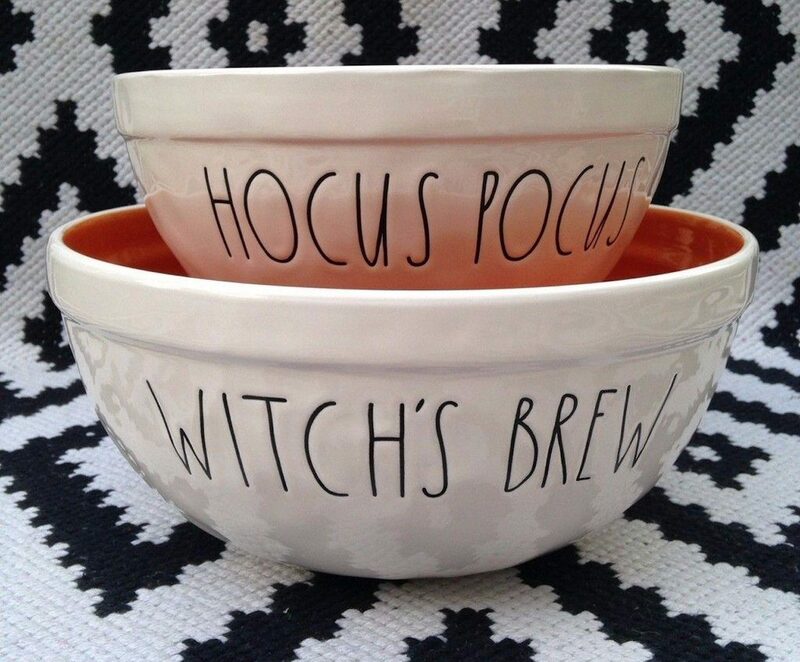 Search online for these nesting bowls which you can use as decorative pieces or for storing candy and other treats. 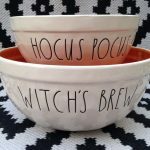 There are certain suppliers who can add personalized lettering or images on the pots which effectively adds some context. 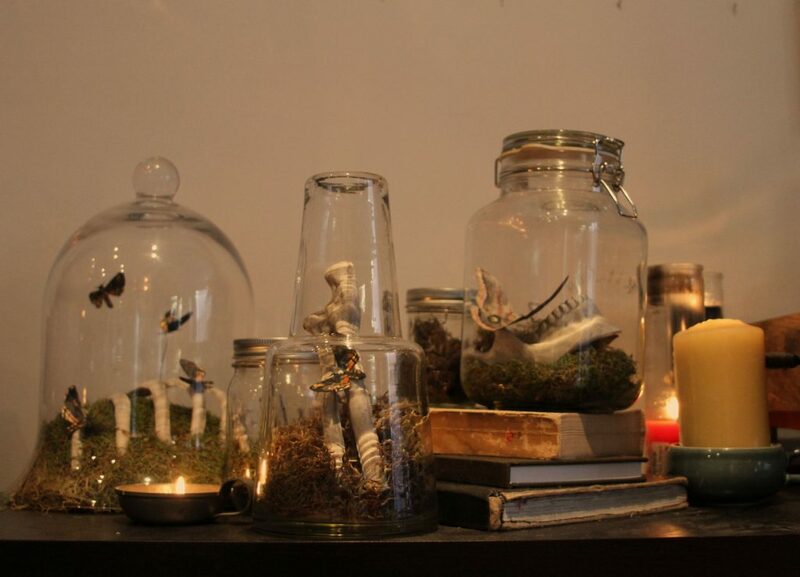 Gather a couple of phoney mini skulls and bones and place them into a transparent vase or jar. This can be placed on a tabletop or mantelpiece to create a creepy ambience. Add a couple of optical illusions such as toy spiders to further enhance the look. 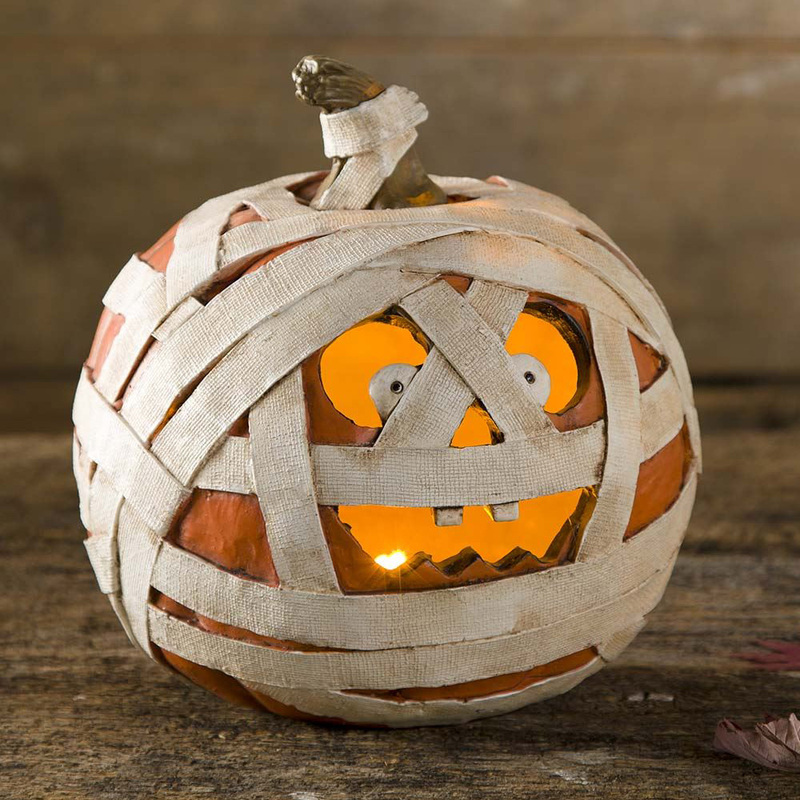 If you’re bored of the same old carved pumpkin you can create a new look by wrapping it in gauze, giving it an even spookier look. 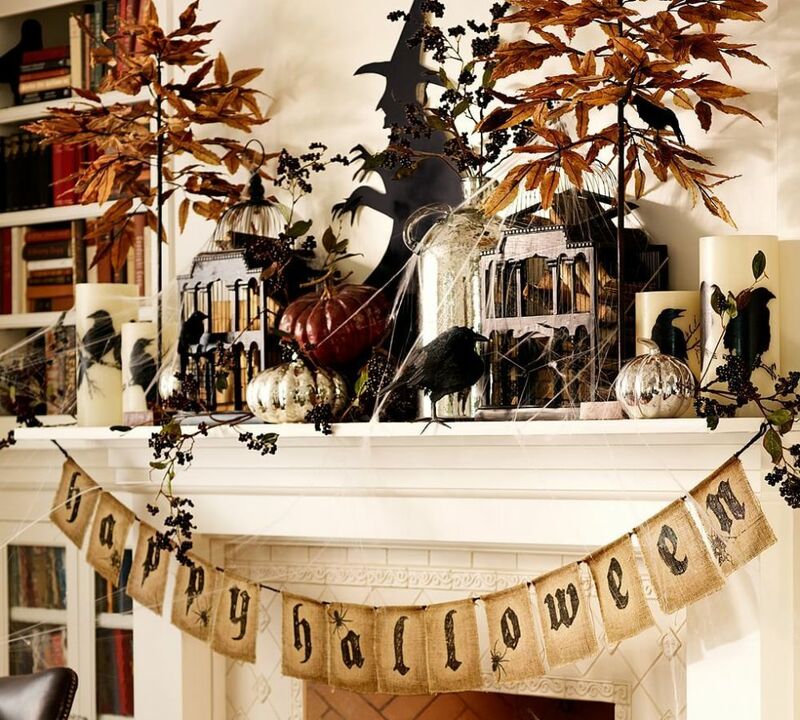 What better way to welcome October than by hanging a spooky aged ‘Happy Halloween’ banner on your mantelpiece. 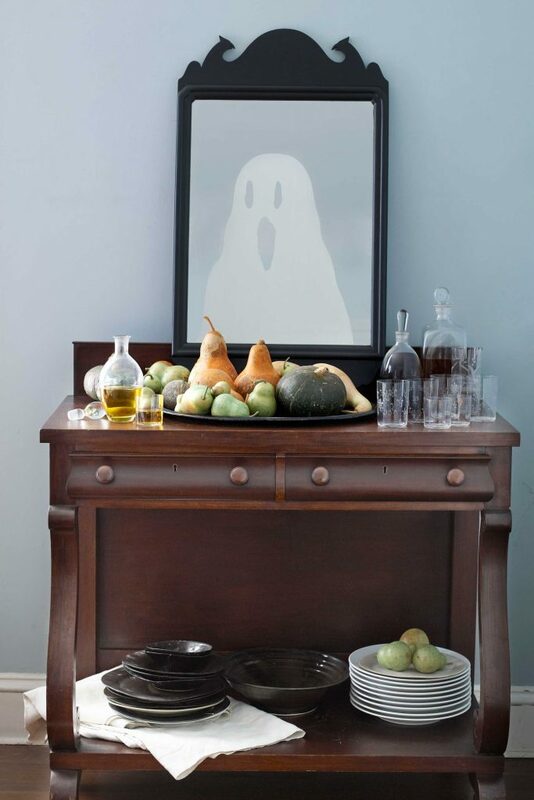 This is a simple yet impactful element of Halloween that can make a difference in your home. Actual pumpkins can get musty and some may even start to rot after carving, so it may be more practical to seek a more permanent option. Wood carved pumpkins are a great alternative because they can be used multiple times with minimal degradation. 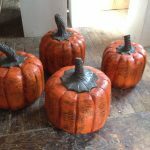 Wood carved pumpkins come in various sizes ranging from table-sized pieces to large gnome-like structures that can be placed on your lawn or backyard. Some carvers offer customized carvings made to your specifications. 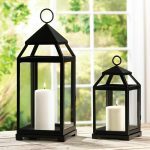 If you want to make your home look like something from a ‘Sleepy Hollow’ set you can invest in several iron and glass lanterns. The accessories are great especially at night and they can be used in different parts of the house. 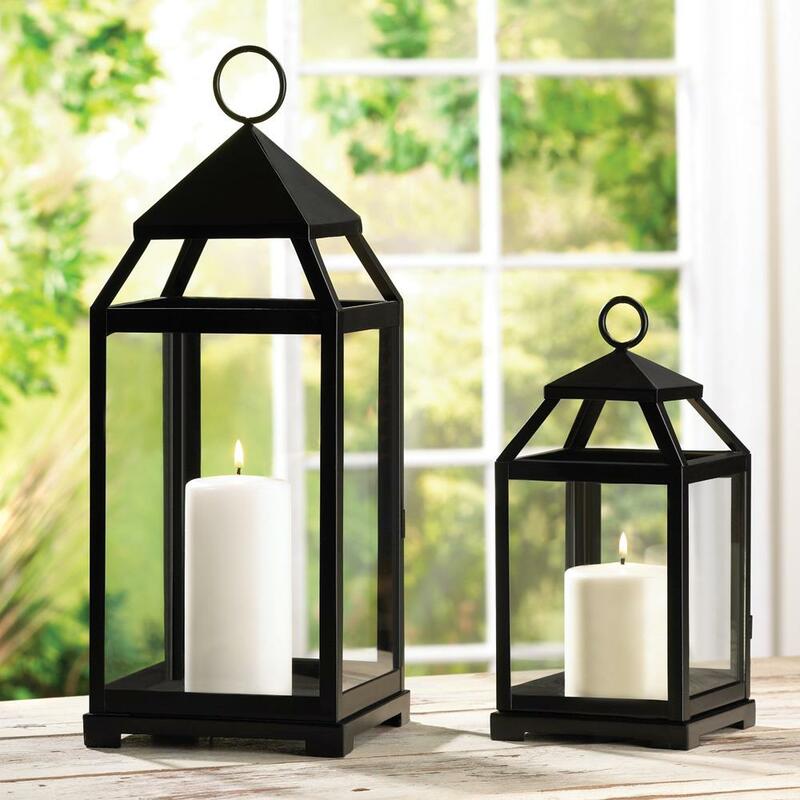 They are also great for outdoor use as long as the weather is favorable. Flowers are always a great addition to any home but when it’s Halloween it is time to try out some new flower arrangements. 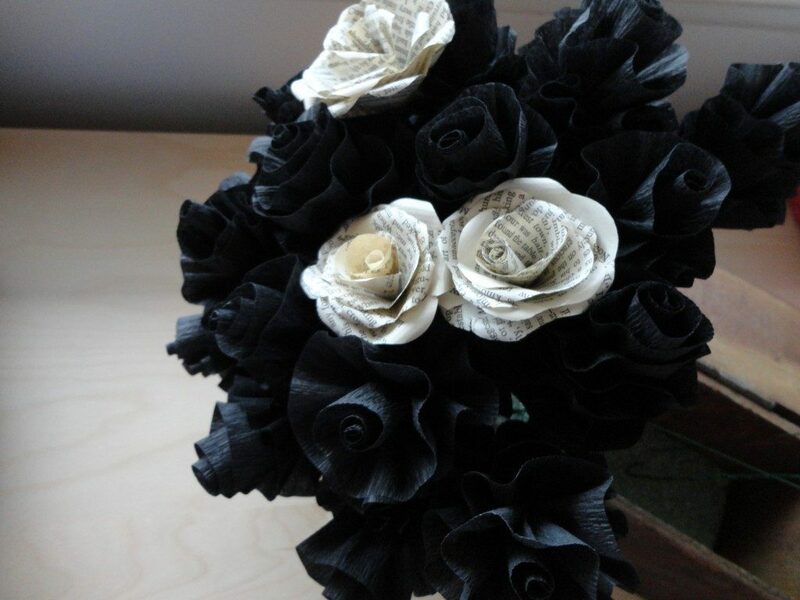 Black bouquets are a great option due to their sinister appearance. You could either buy them or make them at home and place them in bowls around the house. 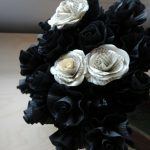 Click here to get a simple tutorial on the steps involved in crafting a paper Halloween flower bouquet. Wreaths are symbolic in nature and when placed on doors in the month of October they are often used to signify the Halloween season. 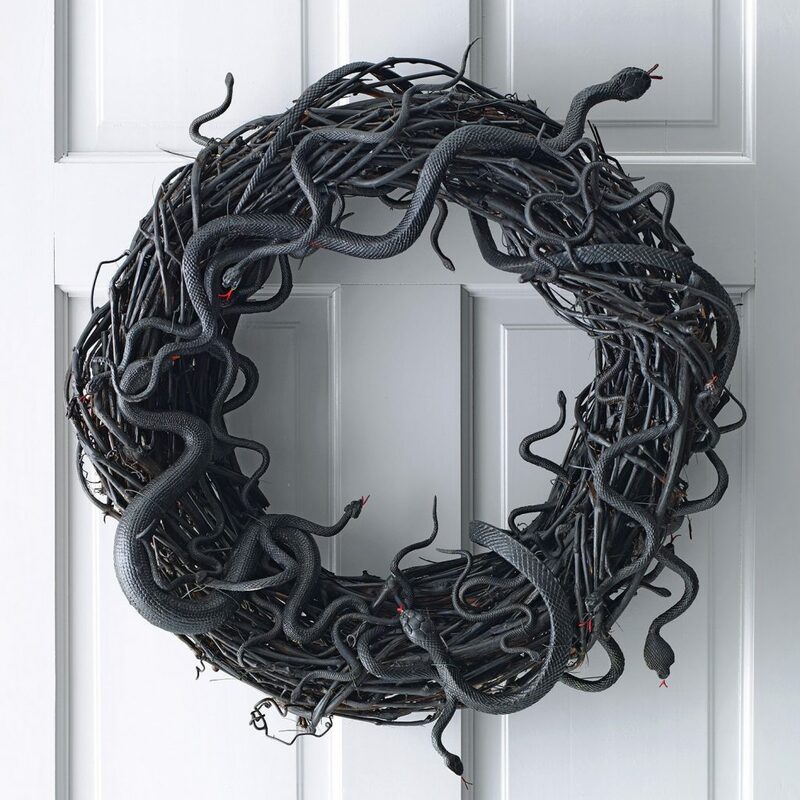 Compared to Christmas wreaths that are often bright and cheery, Halloween varieties are normally of the spooky kind and come in gloomy color schemes (often black). The materials used to make these décor accessories range from natural reeds to crepe paper. Many people opt to come up with their own design in order to achieve the effect that they desire. 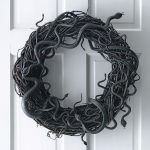 But if you have no time to do it yourself simply shop around for an array of readymade Halloween wreaths available online and offline.